We got our bees back. Happy day! We had bees a couple of years ago, but our handsome Italian beekeeper, Luca, had to take them away when my property was being inundated with dust from a construction project (we were filling in my pool with soil). 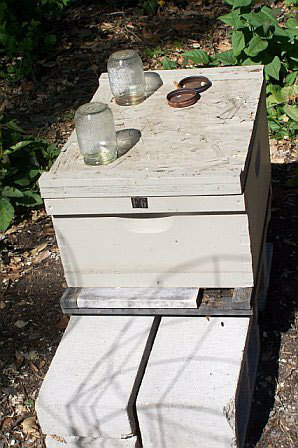 After their move, Luca discovered that the bees were just fine in their new home and didn't want to further stress them by moving them back. So we waited. We bemoaned the loss of our beautiful bees. I loved seeing the flurry of activity in the garden. It wasn't unusual for me to catch a delirious party of four or five bees inside one squash blossom. Such pollination going on! The chef was stung, I think, four times that season while he snipped edible flowers out of the garden. Like any experienced chef, his hands are a mess of cuts, burns, and blisters. He barely complained about the stings; I don't think those bees could harm him more than a 500 degree pan could. He missed them, though, and when Kathy Niven, culinary professor and master beekeeper, offered to provide us with another hive, we jumped at the chance. 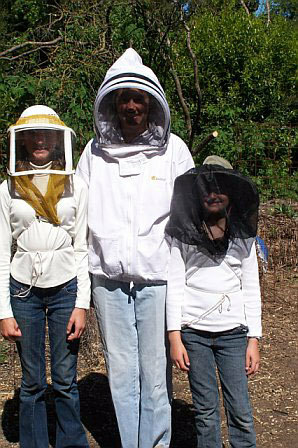 My super fab farm girl apprentice, Rachael Andersen, also jumped at the chance to learn about bees, and along with little sister, Paris, is being taught how to keep bees by professor Niven. I'm pretty much staying out of it; my work load is maxed out as it is. 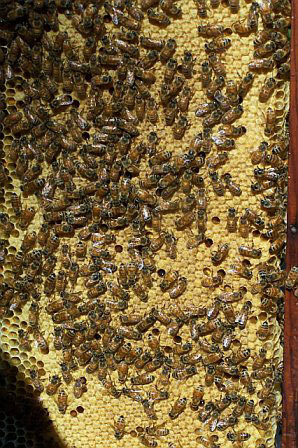 But seeing the increased bee activity at the farm is wonderful. A bee keeper (can't remember who) once told me that if I don't see a bee on every flower, then I don't have enough bees! I tell you, it's sure fun to have them around. When I'm snipping the squash blossoms, and there is a bee inside, it's hard to get them out! I gently shake them, but the bee is usually so ding dang busy in there, she doesn't even know what's going on. I've found them so covered with pollen they seem almost drugged, swerving haphazardly away from the flower, failing miserably at maintaining a bee line back to the hive. The chef says that sometimes the bees make it into his car, still inside the flower. At some point during his half hour drive to the restaurant, a bee will come flying out, buzzing around inside his Volvo, probably wondering where the heck the garden went. You know your produce is fresh when the bee hasn't finished with it yet. We eagerly await our first batch of honey. And chef, no doubt, eagerly awaits his first bee sting from this new hive.